Gj, I lost the first 2 tv2zs; first game got 5 pool so didn't bother saving that. It looks like whichever one gets mutalisks seems broken. Well, I think I'm done with those ones. That's alrighty, though. Rebuild time! Nice playing as always AW! You sure make it look easy to tear down 2 of these at once. Hey guys, I've got a new Zerg AI here. It resembles my old lurker/ling script that eventually gets defilers and ultralisks. What differentiates this new script from the old ones is that the new one uses a lot of resource based triggers for buildings, upgrades and some other things, heavily inspired by Equalizer's work on his Terran scripts! So check it out and let me know if you think it's any good or whatever. For laughs, check this and AccelT v0.8 on Byzantium for a nice bloody fight! Very nice! Looks like I am going to have to do something with my Terran AI to counter defilers better. I really like how it transitions from lurkers to ultras and defilers. This is the first zerg script I've seen where the AI uses dark swarm effectivly and it seems to make it much better not just at attack but at defense as well. The spore colonies also seem to help as well since with some zerg AIs I remember the Terran having a battlecruiser sitting over the zerg's expansion picking off drones. Some hydras might also be useful to help stop air but since terran typicly doesn't make air I don't know if it would be worth while. Haha! You're killing me! I was having fun with this thing, just running over some of the older Terran scripts and then I downloaded AccelDefault T v0.8x and my jaw sort of hit the floor when it suddenly started getting run over in 90 different ways. It's nice having a lot of these really nice T scripts to test against. I don't necessarily mean to just beat them down so much anymore, but getting some wins and if my AI works good the entire game it makes me feel a lot better about releasing it for regular folks to play against. It's still missing a Spire and Scourge loop, the defiler mana upgrade, burrow and the overlord upgrades. What's really surprising is how much a difference upgrades make. Before I added Ultralisk speed & armor and the 2 evolution chambers, it lost and the units just melted away to the +3+3+3+3 units of AccelDefault T v0.8x. I'll add some more Zerglings. Originally this script was really low econ and only made like 6 Drones at expansions, but it was just way too flimsy without the full on max drones at each base. Wow, that's really sick. By the time the first comp was defeated, the other one took like 4 bases and more and built a huge army. I pretty much got ran over, and would have lost had I not resorted to this cheap trick. thnx baja. It's always nice to have reps of ppl playing your own projects. It's getting pretty tough to try making this thing fight against so many really different T scripts. From one extreme, Raynor T 1.2's 4 Barracks rush of doom to Unleaded T's timing rushes to Equalizer's AccelDefaultT's mass of Siege Tanks and even Battlecruisers, there's some really tough competition and scripts to measure by. Reaching a point where It can hold off those scripts sometimes as well as still have enough defense and offense to challenge a human player is sort of my goal with these non-cheating scripts. ...Gonna watch AW's replay now and edit this post when I get done! You did a pretty nice job pounding the first Zerg apart. It was just a little too slow getting to Hive for whatever reason, but that's alright. The other one did some massive expanding and built a huge army of Ultralisks. Not all of the Dark Swarms were badly placed, so that's cool to see in action. It seems to have broke because it had nothing to attack air units with. Maybe Drop/Speed for Overlords, too. Battlecruisers are always cool to see. Do you think this one is stronger or weaker than the Zerg in the 3.5 pack? Oh the naming is fine, as long as the naming is consistent and doesn't have the version number on it-- debug will give that part out. Anyhow you and Equalizer have done a really good job with this. The accelerated method is far superior than any other way I've seen. I would turn my protoss into one of these if I ever want to bother with a new script again. Hey dudes, I haven't gotten an update here in a little while, so here's one! Cooked down and delivered simply, this is me warping AccelDefaultT into a pretty straightforward TvZ machine. So check it out, slip it into BWAI Launcher play against it or watch the replays or just sit there. I'm [s]not[/s] forcing you to play! This is basically done. I just need a TvP section and then I'll grind out the ai v. ai results. 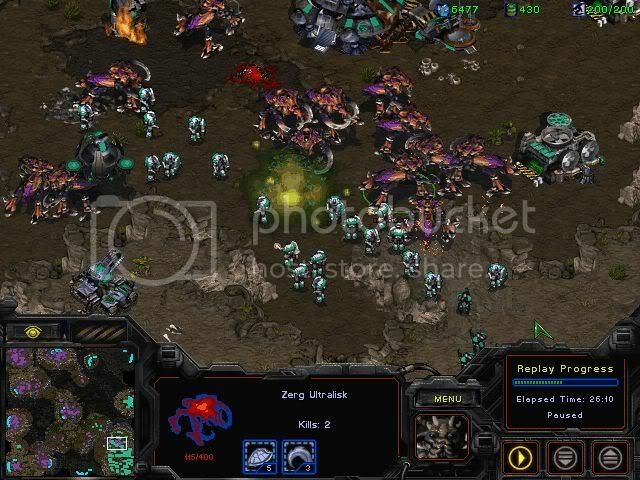 The basics of this is designed around a "Sparks Terran" rush, which seeks to break a sunken wall before Zerg has proper units to defend(Mutalisks or Lurkers). After the initial attack the Terran will keep attacking until victory... or sometimes defeat.